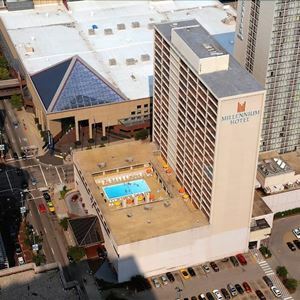 Property Location With a stay at Millennium Cincinnati, you'll be centrally located in Cincinnati, steps from Duke Energy Convention Center and minutes from Fountain Square. This hotel is close to Newport Aquarium and University of Cincinnati. Rooms Make yourself at home in one of the 422 air-conditioned guestrooms. Complimentary wireless Internet access keeps you connected, and cable programming is available for your entertainment. Partially open bathrooms with showers feature complimentary toiletries and hair dryers. Conveniences include phones, as well as desks and coffee/tea makers. Amenities Enjoy recreational amenities such as a fitness center and a seasonal outdoor pool. Additional amenities at this hotel include complimentary wireless Internet access, concierge services, and wedding services. Dining Enjoy a satisfying meal at a restaurant serving guests of Millennium Cincinnati. Quench your thirst with your favorite drink at a bar/lounge. Full breakfasts are available daily for a fee. Business, Other Amenities Featured amenities include complimentary wired Internet access, a business center, and express check-in. Event facilities at this hotel consist of conference space and meeting rooms. With a stay at Millennium Cincinnati, you'll be centrally located in Cincinnati, steps from Duke Energy Convention Center and minutes from Fountain Square. This hotel is close to Newport Aquarium and University of Cincinnati. 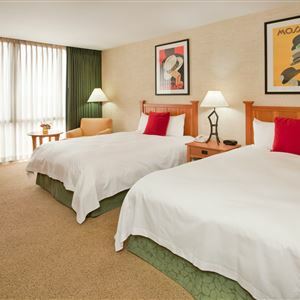 Make yourself at home in one of the 422 air-conditioned guestrooms. Complimentary wireless Internet access keeps you connected, and cable programming is available for your entertainment. Partially open bathrooms with showers feature complimentary toiletries and hair dryers. Conveniences include phones, as well as desks and coffee/tea makers. Enjoy recreational amenities such as a fitness center and a seasonal outdoor pool. Additional amenities at this hotel include complimentary wireless Internet access, concierge services, and wedding services. Enjoy a satisfying meal at a restaurant serving guests of Millennium Cincinnati. Quench your thirst with your favorite drink at a bar/lounge. Full breakfasts are available daily for a fee.